After the major afternoon thunderstorms of Friday and Saturday, the forecast for Sunday/Monday looked good and so we decided to ski Mount Adams and Hood back-to-back. Cyril Benda drove up from Oregon Saturday night to meet me at the Cold Springs TH, with a plan to climb the South Rib and ski the Avalanche / White Salmon Glaciers on Sunday, and then drive across to Mount Hood and up the Cloud Cap Road to the closure gate to car camp before attempting to ski the Sunshine Route on Monday. We reached Cold Springs around 11pm Saturday, finding the road blocked less than 500 ft from the end and probably a hundred cars scattered along the woods at the side of the road, jammed into every conceivable parking spot. We figured everyone would be climbing, skiing, or snowboarding the South Rib or SW Chutes, but expected to find solitude once we headed down the White Salmon Glacier. We left the car at 6:15am, hiked the trail to continuous snow above 6000 ft and skinned up to about 10000 ft on the South Rib. The skis went on the pack for the steeper slope up to the false summit, but then we skinned again from 11500 ft all the way to the roof of the snow-buried cabin at 12300 ft by 12:45pm, the apparent summit but really a few hundred feet SW of the true summit. We decided to wait and rest a bit to allow the snow to soften more on the NW facing slopes on the summit plateau and the west-facing White Salmon Glacier. We skied down at 2pm, the snow heading NW across the summit dome was somewhat rough with sastrugi, but quite skiable. We reached the low point of the saddle between the main summit and the Pinnacle, and dropped down a very short but steep 45-degree pitch onto the White Salmon. Here was perfection, a nice 35 degree pitch with over 1500 vft of the smoothest corn you could ever hope to ski. The southeast parts of the White Salmon Glacier were still uncrevassed, but large seracs and crevasses could easily be seen on the northern and western areas, and the dirty avalanche debris of a recent major serac fall could be seen on the lower portion of the glacier thousands of feet below. We reached the saddle on the moraine between the Avalanche and White Salmon Glaciers at 10200 ft, and made a left onto the more southerly facing slopes of the Avalanche Glacier. No crevasses were visible on any part of this glacier, and the snow surface was smooth and soft all the way down to the flats below 7600 ft. We schussed straight across the sticky mush on the flats to where the SW Chutes and Avalanche Glacier routes converge in the big moraine-filled bowl at 7200 ft. As expected, we saw no one from the time we skied off the summit until we rejoined the skiers coming down the SW Chutes. Instead of attempting to traverse out high from 7000 ft, we skied directly down the outlet stream to reach the Round the Mtn Trail beside a small waterfall at 6100 ft by 3:15pm. We put the skins back on for the 2 miles of up-and-down traversing along this trail, crossing numerous lengthy bare sections of trail before eventually rejoining the South Climb Trail near 6200 ft. We skied down to 6000 ft and hiked back to the car by 5pm. We drove to Hood River for dinner and then headed towards Mount Hood and the Cloud Cap Road. I wish I had a nice photo looking directly up the route, but everything ended up at a very oblique angle. 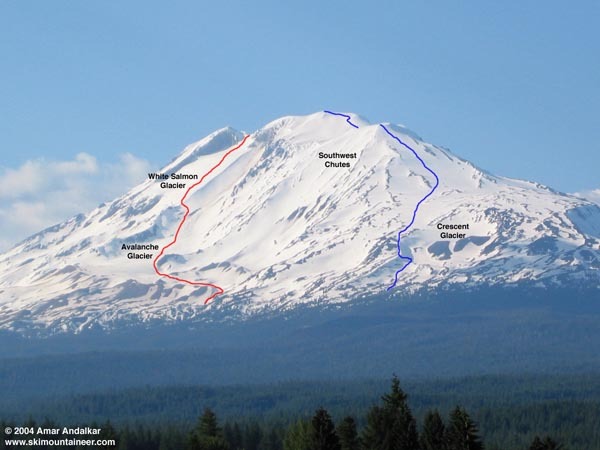 This photo is the standard view from Trout Lake, with the ascent route shown in blue and the ski descent shown in red. Click here for an enlarged version of this photo.